Abstract: Recent research has begun to distinguish two aspects of subjective well-being. Emotional well-being refers to the emotional quality of an individual's everyday experience—the frequency and intensity of experiences of joy, stress, sadness, anger, and affection that make one's life pleasant or unpleasant. Life evaluation refers to the thoughts that people have about their life when they think about it. We raise the question of whether money buys happiness, separately for these two aspects of well-being. We report an analysis of more than 450,000 responses to the Gallup-Healthways Well-Being Index, a daily survey of 1,000 US residents conducted by the Gallup Organization. We find that emotional well-being (measured by questions about emotional experiences yesterday) and life evaluation (measured by Cantril's Self-Anchoring Scale) have different correlates. Income and education are more closely related to life evaluation, but health, care giving, loneliness, and smoking are relatively stronger predictors of daily emotions. When plotted against log income, life evaluation rises steadily. 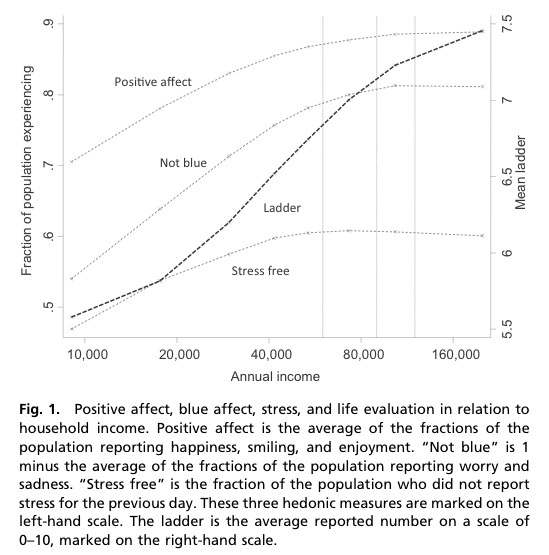 Emotional well-being also rises with log income, but there is no further progress beyond an annual income of ~$75,000. Low income exacerbates the emotional pain associated with such misfortunes as divorce, ill health, and being alone. 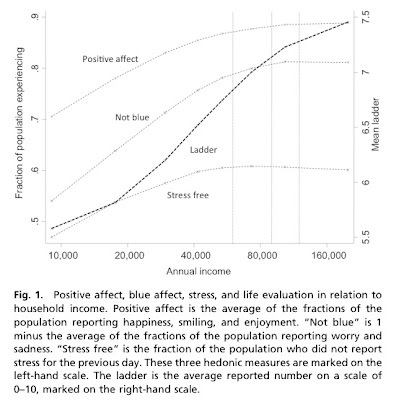 We conclude that high income buys life satisfaction but not happiness, and that low income is associated both with low life evaluation and low emotional well-being.